Over the weekend I watched Exit through the Gift Shop, a film documenting the inside story of street art. 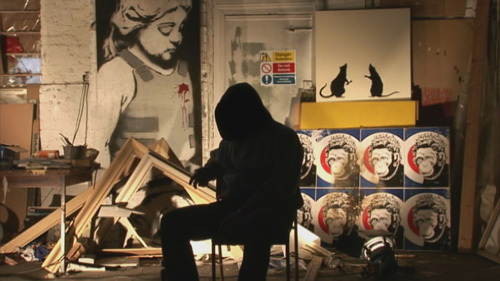 The film follows an amateur filmmaker Thierry Guetta who becomes obsessed with capturing the most famous street artists on film, only to have British stencil artist Banksy turn the camcorder back on Guetta with wildly unexpected results. I loved the movie. There is a mysterious lure to their rebellious artwork. A statement against society that fascinates and inspires me. With that said, after watching the movie I became obsessed with researching the main artists in the film. SPOILER ALERT: (Don’t read any further until you watch the film.) I found articles (here and here) claiming that the movie is a Banksy stunt. They went to the extent of stating that Guetta is actually Banksy. I’m not sure I agree with that but I do think the movie was a stunt. 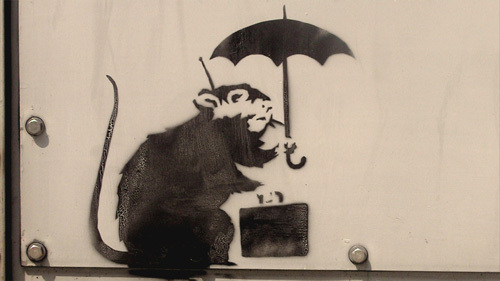 And here is one more article claiming to know the identity of Banksy. It is fascinating none the less, even if it is just a theory. If you are interested in watching the movie it is available on Netflix watch instantly.